Take your improvisations in a new direction with the Horizontal Soloing System! After paying close attention to how Steve Vai’s hands move up and down the fretboard, I concluded that his thinking was far more horizontal than vertical and wanted to replicate this kind of movement. What’s more, it has always felt more natural to me to play up and down the guitar neck in a horizontal fashion rather than vertically, and when I finally got around to exploring horizontal movement on the guitar, and developing the horizontal soloing system, I was blown away by the amount of freedom I had, my melodic sensibility developed, and I generally felt a whole lot more confident when I went to take a solo. 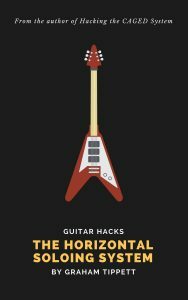 In this eBook, we’ll learn a simple sequence that unlocks the modes of the major scale, then apply the same simple logic to the harmonic minor, melodic minor (and their modes), and pentatonic scales to be able to improvise across the entire neck – all without using any scale patterns! Free if you share it on Facebook or Twitter!